Download this paper to learn which metrics are most commonly used and which are most important to hiring decisions. Knowing which metrics are most important in making the most informed hiring decisions can be a real challenge for HR leaders and hiring managers. 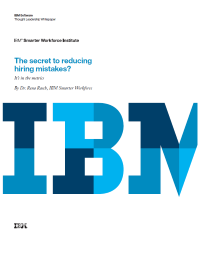 IBM’s Smarter Workforce Institute explored which metrics organizations are using to evaluate their recruitment processes, and how those metrics impact hiring decisions.